Mycophenolate mofetil (MMF) and the sequential use of cyclophosphamide followed by azathioprine (CTX-AZA) demonstrate similar short-term efficacy in the treatment of diffuse proliferative lupus nephritis (DPLN), but MMF is associated with less drug toxicity. Results from an extended long-term study, with median follow-up of 63 mo, that investigated the role of MMF as continuous induction-maintenance treatment for DPLN are presented. Thirty-three patients were randomized to receive MMF, and 31 were randomized to the CTX-AZA treatment arm, both in combination with prednisolone. More than 90% in each group responded favorably (complete or partial remission) to induction treatment. Serum creatinine in both groups remained stable and comparable over time. Creatinine clearance increased significantly in the MMF group, but the between-group difference was insignificant. Improvements in serology and proteinuria were comparable between the two groups. A total of 6.3% in the MMF group and 10.0% of CTX-AZA–treated patients showed doubling of baseline creatinine during follow-up (P = 0.667). Both the relapse-free survival and the hazard ratio for relapse were similar between MMF- and CTX-AZA–treated patients (11 and nine patients relapsed, respectively) and between those with MMF treatment for 12 or ≥24 mo. MMF treatment was associated with fewer infections and infections that required hospitalization (P = 0.013 and 0.014, respectively). Four patients in the CTX-AZA group but none in the MMF group reached the composite end point of end-stage renal failure or death (P = 0.062 by survival analysis). It is concluded that MMF and prednisolone constitute an effective continuous induction-maintenance treatment for DPLN in Chinese patients. Combined use of corticosteroid and either intravenous or oral cyclophosphamide (CTX) has been the conventional treatment for diffuse proliferative lupus nephritis (DPLN) (1–3). Recent data suggest that mycophenolate mofetil (MMF) and corticosteroid can be an effective and well-tolerated treatment alternative. We reported previously that sequential immunosuppressive treatment that comprises prednisolone and oral CTX for 6 mo followed by low-dose prednisolone and azathioprine (AZA) was an effective induction-maintenance regimen and was associated with a high incidence of remission and long-term renal preservation (4,5). Although severe toxicities of CTX such as gonadal toxicity and hemorrhagic cystitis could be largely avoided by limiting its treatment duration, the other adverse effects such as marrow suppression and carcinogenicity remain valid concerns. In this context, we have reported that MMF was an equally effective alternative to CTX when used with prednisolone as initial treatment for DPLN and that >90% of patients responded with complete or partial remission (6). In contrast to CTX, MMF was associated with relatively little adverse effects, and alopecia, permanent amenorrhea, or severe leukopenia occurred only with CTX treatment. Although infection seemed less common among MMF-treated patients, the difference did not reach statistical significance in this 12-mo study (6). Independent investigators have subsequently reported that, after induction with prednisone and intravenous CTX, maintenance immunosuppression that comprised prednisone and MMF was associated with lower risks for death, renal failure, relapse, or infection, compared with prednisone and quarterly intravenous CTX pulses (7). The follow-up duration in this study ranged from 25 to 30 mo, and each treatment group included 19 to 20 patients. The role of MMF given continuously as both induction and maintenance treatment remains undefined, especially with regard to its impact on long-term renal outcome and relapse. We hereby present the results from an extended study on 64 patients, with a follow-up of approximately 5 yr, that investigated the long-term efficacy and tolerability of an MMF-based induction-maintenance treatment regimen for DPLN. Patients with systemic lupus erythematosus, as defined by the 1982 revised American Rheumatism Association criteria (8), and renal biopsy showing diffuse proliferative lupus nephritis (World Health Organization class IV), which corresponded to diffuse segmental or global (IV-S or IV-G) lupus nephritis according to the 2003 International Society of Nephrology/Renal Pathology Society classification (9), urinary protein excretion of 1 g/24 h or above, and serum albumin concentration <35 g/L, were included after written informed consent. The study was approved by the institutional Ethics Committees. Both de novo and nephritic relapse patients were included. Exclusion criteria included serum creatinine concentration >4.52 mg/dl (400 μmol/L), life-threatening complications such as cerebral lupus or severe infection, poor drug compliance, treatment with CTX or MMF within 6 mo before baseline, or treatment with prednisolone at doses >0.4 mg/kg per d orally for >2 wk before baseline. Renal biopsies were examined by light, immunofluorescence, and electron microscopy and were categorized and blindly scored with respect to activity and chronicity (10,11). Patients with membranous features could be included only when there were concomitant diffuse proliferative changes. The patients were randomly assigned by drawing envelopes to one of two treatment groups in an open-label manner within 48 h after renal biopsy: MMF group (MMF plus prednisolone) or CTX-AZA group (CTX plus prednisolone as induction treatment and AZA plus low-dose prednisolone as maintenance treatment). MMF was commenced at 1 g twice daily orally and CTX at 2.5 mg/kg per d orally. The dosages of MMF and CTX remained unchanged within the first 6 mo, except in patients who developed adverse effects of these drugs (see below). According to our original protocol, the dose of MMF would be halved after 6 mo (to 500 mg twice daily), and after 12 mo the drug would be discontinued and replaced by AZA (1 to 1.5 mg/kg per d) (6). AZA was given for at least 1 yr, beyond which the drug was tapered in stable patients. With accumulating experience and data on long-term safety of MMF in this population, a slower rate of tapering was adopted since January 2002 so that MMF dose would be reduced by 25% (i.e., to 750 mg twice daily) after the first 6 mo and continued after the first year at a dose of 500 mg twice daily for at least another year before further tapering in stable patients. For the CTX-AZA group, CTX was replaced by AZA 1.5 to 2 mg/kg per d orally at 6 mo. AZA dose was further reduced to 1 to 1.5 mg/kg per d after 12 mo and continued for at least another year before tapering in stable patients. Prednisolone was started at 0.8 mg/kg per d orally and tapered to reach 10 mg/d at approximately 6 mo. The dose of prednisolone was reduced further to 7.5 mg/d after 9 to 12 mo from baseline and to 5 to 7.5 mg/d at 12 to 15 mo, then maintained at the same dose thereafter. Patients with cellular or fibrocellular crescents that affected more than half of the glomeruli were given methylprednisolone 500 mg/d intravenously for 3 d at the initiation of treatment. Intravenous Ig or plasmapheresis was not used. The criteria for discontinuation of treatment and withdrawal from study included any of the following: Severe leukopenia (white blood cell count <2 × 109/L), thrombocytopenia (platelet count <50 × 109/L) or hemoglobin <8 g/dl, no clinical or serologic improvement after 4 wk of therapy, life-threatening complications (e.g., cerebral lupus, severe infection), pregnancy, severe gastrointestinal upset despite reduction of MMF dosage, or poor compliance. In patients with mild leukopenia (white blood cell count 2 to 4 × 109/L) or thrombocytopenia (platelet count 50 to 100 × 109/L), the dosage of MMF or CTX was halved. In patients who developed gastrointestinal upset after MMF treatment, the dose of MMF was reduced by half, then increased back to the original level. Follow-up intervals increased from weekly to fortnightly within the first 3 mo to every 8 to 10 wk after 18 mo. Clinical and biochemical parameters, including BP and side effects, were recorded at follow-up. Anti-dsDNA antibodies and C3 were measured at every visit. Proteinuria was measured by 24-h urine collection fortnightly during the first month; then monthly for 3 mo; then at 6, 9, and 12 mo; and then every 3 to 6 mo. Creatinine clearance was measured at 0, 6, and 12 mo, then every 6 mo. Target systolic and diastolic BP readings were not to exceed 140 mmHg and 85 mmHg, respectively. In view of the potential confounding effect of angiotensin-converting enzyme inhibitors and angiotensin II receptor blockers on urine protein excretion, these agents were used as second-line antihypertensive treatment or in patients with persistent proteinuria exceeding 1 g/24 h despite quiescent serology beyond 1 yr from baseline. Treatment for hypercholesterolemia would be started in patients who were on maintenance immunosuppression (prednisolone dose <10 mg/d) and whose LDL cholesterol exceeded the upper limit of 135 mg/dl (3.5 mmol/L) despite dietary modifications. The responses to induction therapy were as defined previously (4). Complete remission was defined as urinary protein excretion <0.3 g/24 h with normal urinary sediment, normal serum albumin concentration, and improved or stable renal function (i.e., no “progressive renal impairment”). Progressive renal impairment was defined as a rise in serum creatinine exceeding 0.566 mg/dl (50.0 μmol/L) or a reduction in creatinine clearance exceeding 15% of baseline. Partial remission was defined as stable or improved renal function with reduction of proteinuria by >50%, proteinuria within the range of 0.3 to 3 g/24 h, and albumin >30 g/L. Failure of induction immunosuppression was defined as persistent urinary protein excretion exceeding 3 g/24 h or within the range of 0.3 to 3 g/24 h but with serum albumin <30 g/L, or progressive renal impairment within 12 mo of starting treatment, or permanent discontinuation of treatment as a result of drug side effects. For patients who were in complete or partial remission, disease relapse was defined by clinical manifestations indicating activity, with or without serologic reactivation. An increase in prednisolone dose to 15 mg/d or above was also classified as relapse. Indications for a repeat renal biopsy included the following: Increase of proteinuria by ≥1 g/24 h or serum creatinine by ≥15% over baseline, the latter in the absence of other identifiable causes such as dehydration or drug nephrotoxicity, etc. Renal relapse was histologically confirmed in all cases. Severe focal or diffuse proliferative lupus nephritis was treated with another cycle of induction immunosuppression. The assessment and categorization of clinical outcomes was based on review of anonymized data by a single investigator. This study was an extension of our previous short-term (12 mo) study (6), with additional patients and a longer follow-up. The data as presented did not represent an interim analysis. The primary outcome for between-group comparison was the serial measurements of serum creatinine. Secondary outcomes included relapse, infection, creatinine clearance, doubling of baseline serum creatinine, and the composite end point of end-stage renal failure or death. End-stage renal failure was defined by the need to start dialysis or undergo kidney transplantation. Continuous data were presented as mean ± SD unless otherwise specified. Comparison of continuous variables was by the t test or Mann-Whitney U test where appropriate. Pearson χ2 test or Fisher exact test was used for the comparison of categorical variables. Relapse-free survival was assessed by actuarial analysis and compared by log rank test. The proportional hazards model was used to estimate the hazard ratio for relapse, and corresponding P values were determined by Wald test. Proportionality assumption was tested by plotting log [−log(survival function)] against time (12). Mixed models analysis was used to look for time effect and the significance of between-group difference for each of the continuous variables with repeated measurements over time (13). This method has the advantage of handling missing values. Between-group difference of least squares means (defined as CTX-AZA minus MMF), the latter averaged according to the respective prediction equation for each group across the repeated measures, was calculated for each parameter (13). Variables in the prediction equations included baseline measurement, group, time, and interaction between group and time. Akaike’s information criterion was used to assess the model fitness (14). Data after disease relapse was not included in the longitudinal analyses. Between-group comparison regarding proteinuria was adjusted for baseline proteinuria level. Area under the curve for proteinuria against time was calculated for each patient using the trapezium rule, and analysis of covariance was used to compare values normalized according to the follow-up duration. Statistical analyses were performed with SPSS for Windows 11.0 (SPSS Inc., Chicago, IL) and mixed procedure of SAS for Windows 8.0 (SAS Institute Inc., Cary, NC). Two-sided P < 0.05 was considered statistically significant. Thirty-three patients were randomized into the MMF group, and 31 were randomized into the CTX-AZA group. Fifty patients had newly diagnosed disease (25 in each group), and 14 were relapsed patients. Membranous features were noted in seven and five patients in the MMF and CTX-AZA group, respectively, but none showed pure membranous lupus nephritis. Twelve-month data from the initial 42 patients have been reported previously (6). One patient in each group withdrew within 4 wk because of drug side effects (leukopenia caused by CTX and diarrhea caused by MMF). Longitudinal data from the remaining 62 patients over 3585 patient-months of follow-up (median 63 mo) were analyzed. The duration of MMF treatment was 12 mo in 20 patients and ≥24 mo (mean, 28.3 ± 7.2 mo) in 12 patients. Except for the two deaths (both from the CTX-AZA group, died at 11 and 28 wk, respectively), all had follow-up of >24 mo. Baseline characteristics were similar between the two groups (Table 1). Proteinuria seemed higher in the MMF group, but the difference was not statistically significant. Fifty-two (81.3%) patients had low C3, and 57 (89.1%) patients showed high anti-DNA levels. Seropositivity rate for anti-Ro and anti-La antibodies were 37.5 and 3.1%, respectively. Seventeen (26.6%) patients had elevated serum creatinine, and proteinuria exceeded 3 g/24 h in 40 (62.5%) patients. Body weight was 58.4 ± 12.2 kg at baseline, which was similar to its latest value (P = 0.698). Twenty-four (72.7%) patients in the MMF group and 23 (74.2%) in the CTX-AZA had complete remission. Partial remission was attained by 24.2 and 22.6% of patients in the two groups, respectively. The treatment response was similar between the two groups (P = 0.878). The time to reach complete remission was 15.3 ± 8.9 wk in the MMF group and 19.7 ± 11.2 wk in the CTX-AZA group (P = 0.851). The incidence of complete remission was unrelated to baseline values of proteinuria, serum albumin, serum creatinine, anti-dsDNA antibodies, or C3. Both groups did not show any significant change in serum creatinine over time, and there was no significant between-group difference in serial serum creatinine levels (difference between least squares means, −0.015 mg/dl; 95% confidence interval [CI], −0.283 to 0.253; P = 0.914). Patients who were treated with MMF showed a significant increase in creatinine clearance over time, but the increase did not achieve statistical significance in the CTX-AZA group (Figure 1). The latest creatinine clearance was significantly higher than its baseline level in the MMF group (Figure 2). Between-group difference of creatinine clearance was NS (difference between least squares means, 11.0; 95% CI, −3.4 to 25.5; P = 0.131). Longitudinal profile of serum creatinine (○ and •), creatinine clearance (⋄ and ♦), and proteinuria (▵ and ▴) in patients with diffuse proliferative lupus nephritis (DPLN) treated with prednisolone and either mycophenolate mofetil (MMF; n = 32) or cyclophosphamide-azathioprine (CTX-AZA; n = 30). 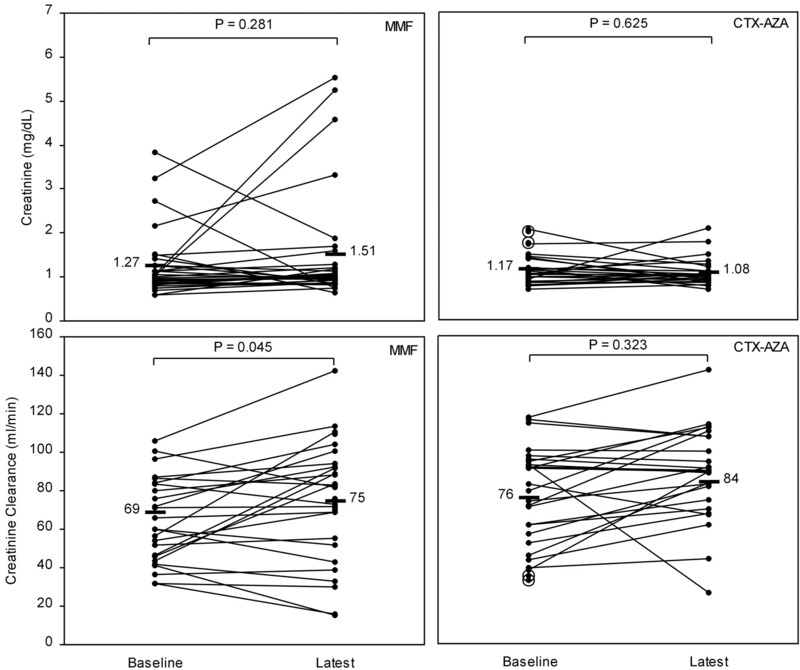 Proteinuria decreased over time in both groups (slope = −0.085 in MMF group, P < 0.0001; slope = −0.055 in CTX-AZA group, P < 0.0001), and creatinine clearance increased significantly in the MMF group (slope = 0.142 in MMF group, P = 0.046; slope = 0.057 in CTX-AZA group, P = 0.450). Serum creatinine did not change significantly over time in both groups (slope = −0.308 in MMF group, P = 0.242; slope = −0.158 in CTX-AZA group, P = 0.356). Values of serum creatinine and creatinine clearance at baseline and at latest follow-up in patients with DPLN treated with prednisolone and either MMF (n = 32) or CTX-AZA (n = 30). The latest creatinine clearance was significantly higher than its baseline level in the MMF group. The two patients denoted by circles in the CTX-AZA group developed end-stage renal failure during follow-up. Seven of the 62 patients (four in the MMF group and three in the CTX-AZA group) showed progressive renal impairment during follow-up (Figure 2), six of whom were relapsers. Two of the three patients in the CTX-AZA group reached end-stage renal failure. Three patients in the CTX-AZA group (10.0%) and two (6.3%) in the MMF group showed doubling of baseline creatinine (P = 0.667). Four of these five patients had abnormal serum creatinine and a chronicity score above 5 at baseline. Anti-DNA antibody titer decreased over time in both groups (slope = −1.229 in MMF group, P = 0.0009; slope = −1.835 in CTX-AZA group, P < 0.0001), with insignificant between-group difference (difference between least squares means, −15.2 IU/L; 95% CI, −65.2 to 34.8; P = 0.545). The increase of C3 over time was significant in patients who were treated with CTX-AZA (slope = 0.288; P = 0.010) but insignificant in the MMF group (slope = 0.165; P = 0.250), and the between-group difference was insignificant (difference between least squares means, 5.0 mg/dl; 95% CI −3.1 to 13.1; P = 0.221). Proteinuria decreased significantly over time in both groups, with insignificant between-group difference (difference between least squares means, −0.64 g/24 h; 95% CI −1.35 to 0.07; P = 0.075; Figure 1). The level of proteinuria at baseline had a significant influence on the subsequent levels during follow-up (P < 0.001). The area under the curve for proteinuria, normalized according to the follow-up duration, was significantly higher in the MMF group (P = 0.043). Serum albumin increased over time similarly in both groups (slope = 0.185 in MMF group, P < 0.0001; slope = 0.157 in CTX-AZA group, P < 0.0001; difference between least squares means, 0.72 g/L; 95% CI, −0.78 to 2.22; P = 0.341). None of the serial parameters showed any significant interaction between group and time. Disease relapse affected 11 patients in the MMF group and nine patients in the CTX-AZA group after achieving remission, at 20.2 ± 13.4 and 32.7 ± 17.9 mo from baseline, respectively (P = 0.080). Seventeen of the 20 relapses (nine in the MMF group and eight in the CTX-AZA group; P = 1.00) showed clinically significant renal involvement, and repeat renal biopsies showed diffuse proliferative, focal proliferative, and mesangial proliferative features in 11, five, and one patient, respectively, with similar distribution in the two groups (data not shown). 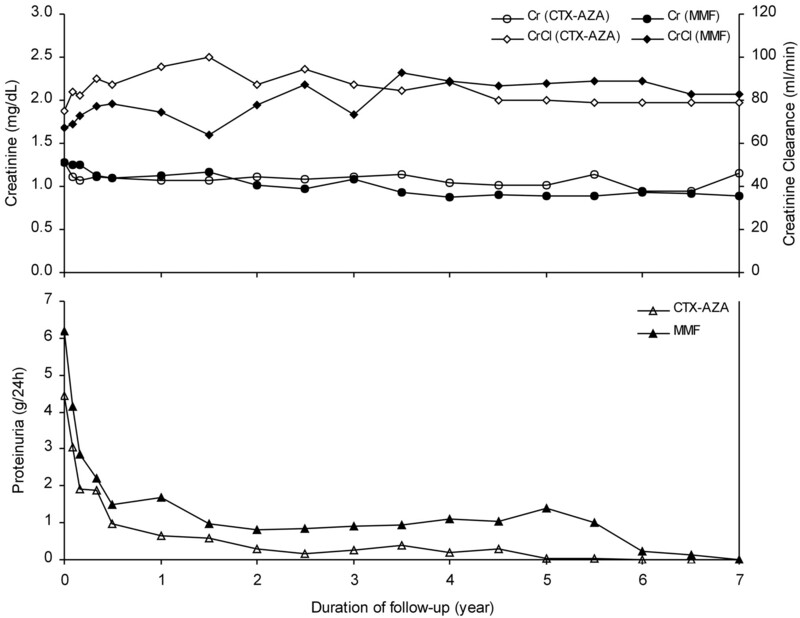 Compared with patients who were treated with CTX-AZA, the relapse-free survival after attaining remission was similar in MMF-treated patients (Figure 3), patients who had received MMF for 12 mo (P = 0.605), or those with ≥24 mo of MMF treatment (P = 0.101). Relapse-free survival also did not differ between the two MMF subgroups (P = 0.538). Relapsers and nonrelapsers showed similar baseline creatinine, creatinine clearance, proteinuria, activity score, and chronicity score (P = 0.262, 0.497, 0.723, 0.137, and 0.389, respectively), and the risk for relapse was not related to the response after induction treatment (P = 0.537). Relapse-free survival after achieving remission in patients with DPLN treated with prednisolone and either MMF (n = 32) or CTX-AZA (n = 30). Relapse-free survival after remission was similar between the two treatment groups (P = 0.338). Compared with patients in the CTX-AZA group, the hazard ratio for relapse was 1.536 (95% CI, 0.634 to 3.722; P = 0.342) in patients who were treated with MMF, 1.296 (95% CI, 0.482 to 3.485; P = 0.607) in the short-term MMF (12 mo) subgroup, and 2.345 (95% CI, 0.690 to 7.965; P = 0.172) in the long-term MMF (≥24 mo) subgroup (P = 0.543 comparing the two MMF subgroups). Significantly fewer MMF-treated patients developed infections that necessitated antibiotic treatment or infections that required hospitalization, compared with the CTX-AZA group (P = 0.013 and 0.014, respectively). The incidence of infection was 1 in 234.0 patient-months in the MMF group and 1 in 102.5 patient-months in the CTX-AZA group (rate ratio, 2.284; 95% CI, 0.960 to 5.432; P = 0.062). The incidence of hospitalized infections was 1 in 327.6 patient-months in the MMF group and 1 in 177.0 patient-months in the CTX-AZA group (rate ratio, 1.851; 95% CI, 0.643 to 5.327; P = 0.254; Table 2). Four patients in the CTX-AZA group but none in the MMF group reached the composite end point of end-stage renal failure (two patients) or death (one as a result of miliary tuberculosis and the other as a result of cerebral hemorrhage; P = 0.049). The difference was NS by survival analysis (P = 0.062). Leukopenia and alopecia were observed only in the CTX-AZA group. Gastrointestinal upset occurred in three (9.1%) patients during MMF treatment and in one patient during AZA treatment. One MMF-treated patient withdrew from the study because of diarrhea, and three patients from the CTX-AZA group withdrew because of adverse effects of treatment (CTX-induced leucopenia in two, AZA-induced gastrointestinal upset in another; P = 0.347). Amenorrhea occurred less frequently in patients who were treated with MMF (3.6 versus 36.0% in the CTX-AZA group; P = 0.004), and it was transient in the MMF-treated patient but permanent in five (55.6%) of the nine patients in the CTX-AZA group. Sixteen MMF-treated patients required antihypertensive treatment throughout the follow-up period. The number of hypertensive patients increased from 12 at baseline to 13 at last follow-up in the CTX-AZA group (P = 0.429 and 0.599, respectively, compared with the MMF group). One patient in each group developed diabetes. Nine (28.1%) patients in the MMF group and six (20%) in the CTX-AZA group were treated for hyperlipidemia (P = 0.455). None developed avascular necrosis of bone. We reported previously that a treatment regimen that comprised prednisolone and 12 mo of MMF showed equivalent efficacy as our standard regimen of prednisolone and 6 mo of cyclophosphamide followed by azathioprine in the treatment of DPLN, both achieving remission rates of approximately 80% (6). The treatment failures were attributed to death (only in the CTX-AZA group) or withdrawal as a result of drug intolerance (4.8% in each group), and none of the patients had uncontrolled disease activity that was resistant to treatment. Leukopenia, alopecia, and amenorrhea were observed only in the CTX-AZA group, and there was a trend toward fewer infections in MMF-treated patients. These differences, however, did not reach statistical significance because of the small sample size (n = 42). In addition, although the renal function remained stable in both groups, the short study duration of 12 mo precluded conclusions regarding relapse and long-term renal preservation. This extended study aimed to define the role of this MMF-based regimen in the treatment of DPLN, with a bigger sample size and prolonged follow-up. It is noteworthy that in this regimen, MMF is used continuously as both induction and maintenance treatment. Similar to our earlier observations, leukopenia and alopecia were not observed in MMF-treated patients, who also had a 10-fold reduction (3.6%) in the risk for amenorrhea compared with CTX-treated patients. These differences were highly significant statistically. Of particular note is the reduced risk for any infection as well as hospitalized infections in MMF-treated patients compared with the CTX-AZA group, despite an identical corticosteroid regimen in both groups. The difference in the risk for infection was less apparent when the incidence was normalized according to the number of patient-months, because three patients (one in MMF group, two in CTX-AZA group) had repeated infections. Notwithstanding this, these results demonstrate the improved safety profile and tolerability of the MMF-based regimen compared with CTX. Longitudinal data from our patients showed a similar profile of serologic and renal parameters in the two groups over time. The higher area under the curve for proteinuria against time in the MMF group could be explained by the higher baseline proteinuria in this group, although the latter did not reach statistical significance. Other investigators have shown that prolonged follow-up for at least 5 yr is required to investigate the impact of treatment on long-term renal function (1). In this study, the level of serum creatinine remained stable during follow-up and was comparable between the MMF and CTX-AZA groups. It is of interest that creatinine clearance showed a significant increase only in MMF-treated patients, although the between-group difference was not statistically significant. A possible explanation for the apparent discrepancy between creatinine clearance and serum creatinine in the MMF group could be a change in muscle mass over time. Our results showed stable body weight during follow-up, but muscle mass was not included as a study parameter. In this study five (8.1%) of the 62 patients showed doubling of baseline serum creatinine during 63 mo of follow-up, and the incidence was similar between the two groups. The incidence of renal failure was similar to our single-center study on 66 Chinese patients who had DPLN and were treated with the CTX-AZA regimen, in which 4.6% showed doubling of baseline creatinine during 87 mo of follow-up (5). In this regard, other investigators have observed doubling of baseline serum creatinine in 20 to 30% of patients who were treated with corticosteroid and intravenous cyclophosphamide over 36 mo of follow-up, and at 10 yr, 21.4% of patients had either died or developed end-stage renal failure, and another 11.7% developed chronic renal failure (15,16). Thus, both the short-term and long-term renal outcomes after treatment, as indicated by the remission rate and the incidence of renal failure, seemed relatively favorable among our patients whether they had been treated with MMF or CTX-AZA. It would be difficult to compare remission rates across different series, in view of the different definitions of remission. Nevertheless, the data implicate population differences in terms of clinical outcome. Potential contributing factors, which might interact with one another, include ethnic variations in disease progression and/or response to treatment and differences pertaining to baseline characteristics, timing of presentation, compliance, or socioeconomic status (3,15,17,18). While these data affirm the efficacy of the MMF-based regimen not only in inducing remission but also in long-term renal preservation, it is imperative to exercise caution in the treatment of non-Chinese subjects, until more extensive experience in different patient populations is available. In this context, recent data from a multicenter study in the United States that compared MMF and intravenous CTX as induction treatment in 140 patients with severe lupus nephritis showed comparable efficacy with the two treatments at 6 mo, with fewer severe infections in the MMF arm (19). It is noteworthy that the target daily MMF dose of 3 g was relevant to the large number of black patients in this study. In contrast, we used 1 g twice daily as induction dosing for MMF in our Chinese patients. In this regard, the 3-g/d dosing is also recommended for blacks undergoing kidney transplantation, as compared with 2 g/d for whites, based on data from clinical studies that showed different propensities for acute rejection in blacks and whites (20). Four of the five patients who developed doubling of baseline creatinine had abnormal serum creatinine and chronicity score above 5 at baseline. The association between chronic histologic changes and/or impaired renal function with unfavorable long-term renal outcome is in accordance with previous data from our group and others (3,15,21). Other investigators have reported a graded relationship between the chronicity index and renal prognosis and an increased risk for renal failure in patients with chronicity score above 4 (22). However, not only did the graded relationship not apply to the activity index, but also the prediction of renal survival based on histologic features of activity or chronicity can be imprecise, especially at the level of individual patients (23,24). Although inferior renal survival had been associated with a chronicity index above 3 and an activity index of >10 (22), other investigators had shown that despite a high baseline activity index, a favorable long-term renal outcome could still be achieved provided that remission was attained after treatment (3). While the primary objective of induction therapy in severe lupus nephritis is to induce remission by reversing the immune-mediated inflammatory processes, maintenance immunosuppressive treatment aims to prevent relapse with agents that are safe for long-term administration at doses that are associated with a low risk for complications. Patients with a history of lupus nephritis are often maintained on low-dose corticosteroid alone or in combination with quarterly CTX pulses or AZA. Definitive conclusions regarding the relative efficacy of different maintenance immunosuppressive treatment regimens remain elusive. Heterogeneity related to patient characteristics and treatment responses and the requirements for a large sample size and prolonged follow-up present challenges to clinical studies in this area. Lengthening the duration of potent immunosuppressive agents such as CTX might delay the occurrence of relapse, although the ultimate cumulative incidence may be unaltered (25), and drug toxicities such as amenorrhea, hemorrhagic cystitis, or malignant predisposition are valid concerns. A recent study compared maintenance treatments that comprised corticosteroid in combination with MMF, AZA, or quarterly intravenous CTX in patients who had received prednisone and intravenous CTX as induction treatment over a follow-up of 25 to 30 mo (7). The investigators reported that maintenance treatment with prednisone and MMF was associated with reduced risks for death or renal failure, relapse, and drug-induced complications in particular infection, compared with patients who were maintained on prednisone and quarterly CTX pulses. Six of 20 patients in the CTX maintenance group either died or reached end-stage renal failure, and eight patients relapsed during the maintenance phase. In contrast, two of 20 patients in the MMF maintenance group reached the combined end point of death or renal failure, whereas three patients relapsed. Relapse-free survival was similar with MMF or AZA maintenance. Blacks and Hispanics accounted for >90% of patients in this U.S.-based study; thus, these observations may not be extrapolated to other ethnic groups or health care systems. Indeed, our own data suggest lower rates of death, renal failure, or relapse among CTX-AZA–treated Chinese patients, compared with patients on CTX maintenance in the study by Contreras et al. (7). On the basis of survival analysis, the cumulative relapse rate at 5 yr in our MMF-treated patients was approximately 40%. For comparison, we have reported that relapses occurred in 39% of patients on CTX-AZA treatment during 87 mo of follow-up (5), and other investigators have reported relapse rates of 41% over 4 yr or 37% over 5 yr in patients who were treated with CTX induction followed by AZA maintenance (26,27). In another study on patients who were treated with pulse cyclophosphamide, pulse methylprednisolone, or the combination of both, 45% of patients relapsed during 117 mo of follow-up (15). When we first devised the MMF-based treatment regimen, the dose of MMF was empirically reduced from 1 g twice daily to 500 mg twice daily after 6 mo, and MMF was discontinued after 12 mo because of financial limitation. Noting the occurrence of relapse in some patients within a few months after MMF dose reduction or substitution of CTX with AZA and in view of the accumulating experience and safety data on long-term MMF treatment, we have subsequently adopted a slower pace of MMF dose tapering and extended the treatment duration to a minimum of 2 yr. These data show comparable relapse rates between patients who were treated with the CTX-AZA regimen and those who were treated with MMF. There is no apparent difference in the risk for relapse between those who received 12 mo of MMF and patients on the protocol with slower tapering and longer treatment duration, although the statistical power is insufficient to reveal minor differences between the two MMF subgroups. Nevertheless, these data demonstrate that MMF in combination with corticosteroid can be used as a safe, well-tolerated, and reasonably effective long-term maintenance treatment in lupus nephritis. Further studies are required to compare the efficacy of MMF with other antiproliferative agents in the prevention of relapse and to define an optimal MMF maintenance regimen. In summary, results from this extended study show that our MMF-based induction-maintenance regimen has comparable long-term efficacy regarding renal preservation and the prevention of relapse as the sequential CTX-AZA regimen but is associated with significantly reduced unfavorable outcomes, in particular infection and amenorrhea. On the basis of these findings, we conclude that MMF is the preferred antiproliferative agent in induction treatment, and MMF in combination with low-dose corticosteroid presents an appropriate maintenance regimen for Chinese patients with severe proliferative lupus nephritis. Further long-term studies are required to document the treatment outcome in other patient populations. This study was supported by the Wai Hung Charity Foundation and the Lee Wing Tat Renal Research Fund. Interim data from the study were presented in abstract form at the 2001 Annual Meeting of the American Society of Nephrology, San Francisco, CA, October 10 to 17, 2001 (J Am Soc Nephrol 12: 195A, 2001). Membership of the Hong Kong Nephrology Study Group: Nephrology Division, Department of Medicine, University of Hong Kong, Queen Mary Hospital, Hong Kong: Tak Mao Chan, Kai Chung Tse, Fu Keung Li, Sydney Chi Wai Tang, Colin Siu On Tang, Man Fai Lam, Terence Pok Siu Yip, and Kar Neng Lai; Rheumatology Division, Department of Medicine, Queen Mary Hospital, Hong Kong: Mo Yin Mok, Chak Sing Lau, and Raymond Woon Sing Wong; Department of Pathology, University of Hong Kong, Queen Mary Hospital, Hong Kong: Kwok Wah Chan; Nephrology Department, Sun Yat Sen University of Medical Sciences First Affiliated Hospital, Guangzhou: Xue Qing Yu; Department of Medicine, Princess Margaret Hospital, Hong Kong: Wai Kay Tsang and Matthew Kwok Lung Tong; Department of Medicine, Kwong Wah Hospital, Hong Kong: Andrew Kui Man Wong. Lupus Nephritis: Induction Therapy in Severe Lupus Nephritis--Should MMF Be Considered the Drug of Choice? What Have We Learned about Optimal Induction Therapy for Lupus Nephritis (III through V) from Randomized, Controlled Trials? Mycophenolate mofetil for lupus related myelopathy.